Help your children build a brighter financial future. It's tough to think about any type of savings account for your kids when you're shelling out a fortune for diapers. It's easy to feel overwhelmed when day care takes a significant bite out of every paycheck. Still, time is on your side if you start early. Let that first sonogram inspire you, and remember that saving even a little is better than saving nothing at all. 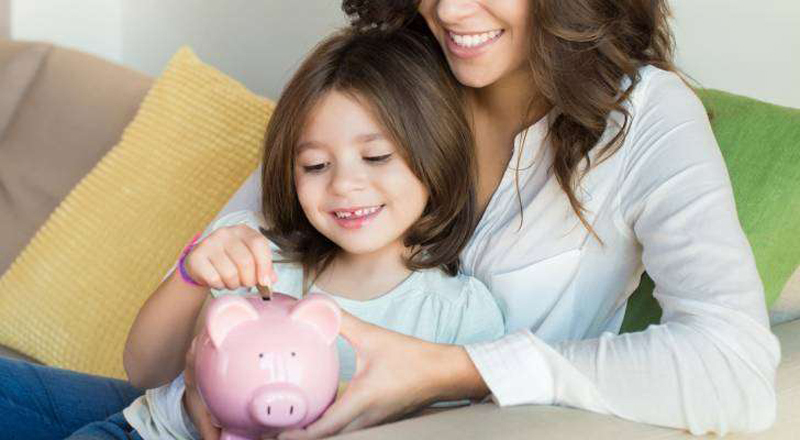 Here are nine ways to put your child on the path to lifelong saving. According to researchers at Washington University in St. Louis, saving for college increases the likelihood that your children will attend and finish. Look into 529 plans in your state. A child savings account benefits from tax-free growth. In a 529 education savings plan, funds are earmarked for qualified expenses such as a portion of private K-12 tuition, college tuition, and room and board. A 529 prepaid tuition plan pays future tuition at current prices, but it's limited to in-state public schools. Be sure to let the grandparents know that anyone can contribute to the kids savings account at any time. The greatest advantage of savings accounts is that they earn interest. Compound interest — that is, interest earned on interest — grows at astonishing rates if you consistently save and leave the money alone. There are several high-yield savings accountsthat compound substantial interest. There are a couple of downsides. The interest earned is taxed each year, and it's easy to access the funds. When kids start whining about going to Disney World, many parents are tempted to dip into savings. If you're tempted, consider investing in a certificate of deposit, which will lock the money in for a fixed term while gaining interest. Fees and other costs vary from bank to bank, so do your homework. Comparison shopping will also reveal discrepancies in interest rates. Some institutions pay up to 25 times higher interest than others. You can open an investment account to help save for your child. You can involve them in your own trading practices as well to help them learn! Teaching your kids how to invest wisely has profound long-term benefits. Some of the best and least expensive brokerages are online. Most don't charge fees or set minimums on initial deposits and balances. They keep trade commissions low. This gives kids a chance to practice trading with little investment up front. Many brokers feature online tutorials and learning activities for kids. You can also simply open up an Acorns account, which automatically invests using your spare change, and dedicate it to saving for your child. Involve them in the process, and let them watch the savings grow to demonstrate the power of investing. These are highly rewarding investment vehicles for people of all ages. You can set a Roth IRA up with any discount brokerage and contribute up to per year. Although you'll be taxed on the money in the account while you save, growth and distributions are tax-free. That's a nice perk when it's time to start college, buy a first home, launch a small business or retire. Roth IRAs are popular for their flexibility. There are dozens of investment options. Note that you can only withdraw from the principal after five years, without being penalized. The Coverdell education savings account (ESA) was formerly known as the "educational IRA." It's similar to a 529: Investment growth and withdrawals for qualified expenses are tax-free. Coverdells, however, can be used for a broader range of expenses at eligible schools. Examples include elementary and secondary textbooks, certain supplies, equipment, special-needs services and tutoring. These accounts are available only for families below a certain income level, and maximum contribution limits are capped at $2,000 per child a year. Some parents lie awake at night imagining their kid blowing a sizable inheritance on reckless living. Irrevocable trusts are designed to prevent irresponsible spending. You can fund a trust with cash, stocks or other assets. A trustee, such as a banker or attorney, manages it. You can stipulate how the money is to be used. You can set up the account to pay out in increments over time rather than in a lump sum. You may outline certain conditions that must be met. Management costs can be expensive, but peace of mind is worth it for some parents. Custodial accounts also are known by the acronyms UTMA and UGMA because they're based on the Uniform Transfers to Minors Act and the Uniform Gifts to Minors Act. The accounts are held and managed for minors until they reach the age of majority in their state. Wealthsimple, an automated investment service, can help you create and manage a custodial account. Custodial accounts can involve an investment portfolio, or can be a savings account. They're less expensive than conventional trusts because the terms and conditions are predetermined. The first $1,050 of income in a custodial account is tax-free, but an equal portion is taxed at what is known as the kiddie tax rate. Anything over $2,100 is taxed at the parents' rate. No premature withdrawals are allowed, and the money must only be spent to benefit the child. The Education Savings Accounts for Military Families Act of 2018 is a bill under consideration in Congress. If it's passed, a portion of the funding from the Impact Aid program will be available for military families to start ESAs. The child savings account could be used for things like private school tuition, supplies, online classes and tutoring. Parents serving the country on active duty have few choices about where they live or what schools their kids attend. The new legislation would give them more options in high-quality education. The Federal Reserve Bank of St. Louis has lots of resources for training kids in good stewardship of money. Learn how to involve your children in saving, budgeting, setting up a kid's bank account, shopping wisely and tracking expenses. Teach Children to Save is a free national program geared to kindergarteners through eighth-graders. Bankers who volunteer with the program teach kids about opening a bank account and developing a habit of saving. Contact the American Bankers Association to find participating banks.